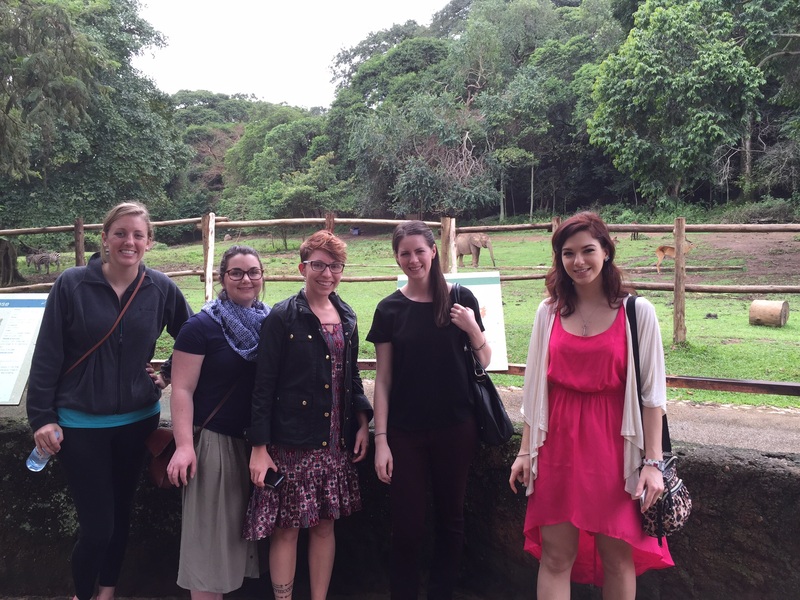 Hanna, Lizzie, Amanda, Stacy, and Kristen (Left to Right)- Check out the baby elephant in the background! We have had a great day! First of all we were very happy to retrieve Hanna from the airport and welcome her to Uganda- now our team is complete. Hanna had been expected to arrive Friday night but the flight for the last leg of her journey from Nairobi, Kenya to Entebbe, Uganda was cancelled due to a pilot strike. She ended up having to stay in a hotel overnight, but at least it was complimentary per the airline. This morning she arrived safe and sound, but unfortunately her luggage didn’t arrive with her. For some unknown reason, it seems to have been routed to Dubai, but should hopefully get here tomorrow and the airline said they’d deliver it to the Mulago Guest House. After picking up Hanna, we went to the Entebbe Zoo which was a really treat. I hadn’t had a chance to go here before and although small, it had a nice variety of animals and the enclosures seemed pretty large. The animals were active and appeared to be well-taken care of. The experience of seeing lions, zebras, monkeys, chimps, elephants, antelopes, crocodiles, and other animals stoked our enthusiasm for the Murchison Falls Safari we will take at the end of this trip. I think the most favorite animal of all today, though, was the African Rock Python. It’s keeper had removed it from the enclosure and brought it out on the lawn. He held it and let it wrap itself around him and did this in a way that he said would kill a man. We were all thinking, “then why are you letting it wrap around your torso?”. But, I guess as a professional, he knew what he was doing. He also allowed those present to hold and/or touch the enormous snake. Stacy and I gladly volunteered to take the pictures and while Lizzie did go up and touch the snake, I don’t think she was unhappy when other people crowded her out of the “holding the snake” routine. We had a lovely lunch in Entebbe in a restaurant on the shores of Lake Victoria. We sat out on a covered deck but the weather was not so nice today as it turned into a steady, cool rain. We all had hot drinks like french press coffee and African Tea to keep warm. The latter is tea made with hot milk and flavored with a Masala spice- kind of like Chai. After lunch it was off to the mall to get Hanna a few items to tide her over until her suitcase arrives. The rest of the day entailed driving home, a ride which put almost all of us to sleep, then a couple of hours of free-time, followed by a yummy meal of pizza at an Italian restaurant. 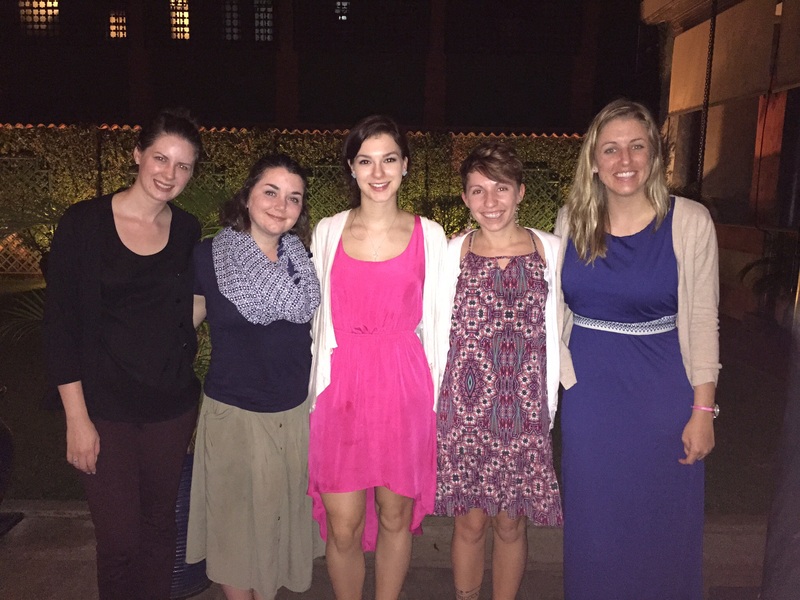 The whole crew after a delicious Italian dinner at Il Patio in Kampala. This entry was posted in My Safari (My Journey/Adventure) and tagged African animals, APPE, college of pharmacy, Entebbe Zoo, giraffe, Global Health, pharmacy residents, Pharmacy Students, Wilkes University. Bookmark the permalink. Karen, thanks so much for doing this blog! It is so nice to be able to keep up with your travels, adventures and professional work in Uganda. Looking forward to reading about the Easter Service! 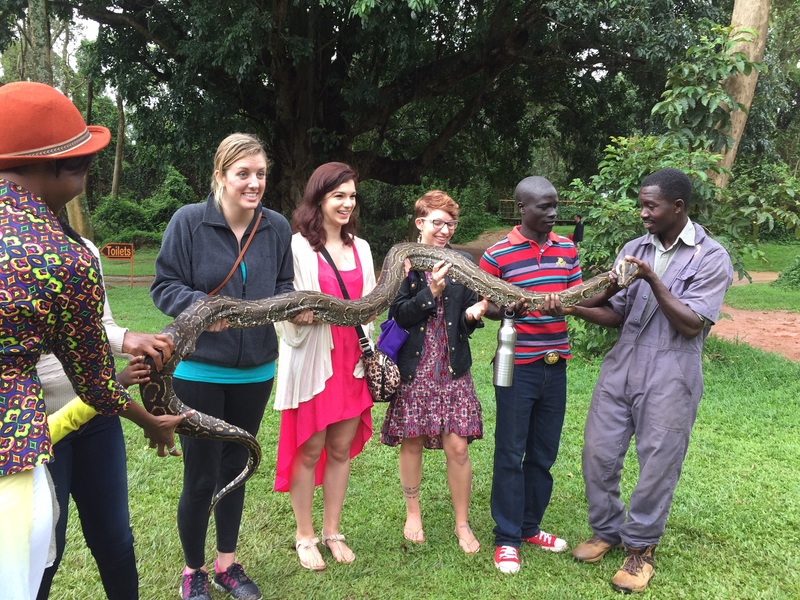 Hmm…holding a python! Can’t wait to see what the girls will do on the safari!! !